I must echo Mark Perry on this (check out his latest post for lots of juicy details), since it represents a big positive change on the margin that supports the outlook for the U.S. economy. 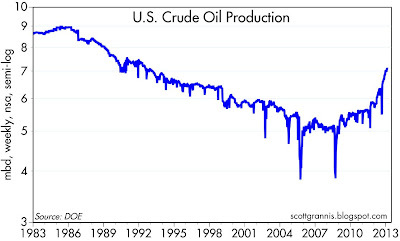 U.S. crude oil production is up 22% in the past year, and has risen by an astounding 34% in the past four years. This is more than a recovery from recession, this is effectively a whole new industry that is being built on the back of new drilling technologies. 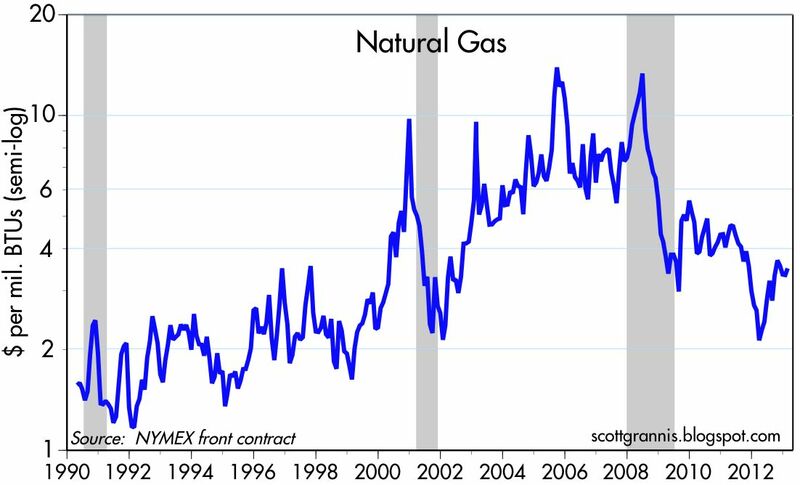 Along with the rise in crude oil production which started 2008 has come a virtual gusher of natural gas, which in turn has resulted in a huge decline in natural gas prices. 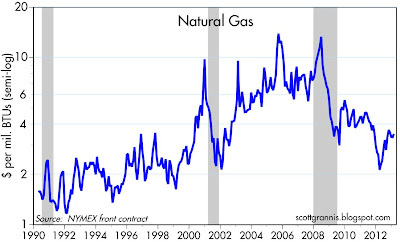 As the chart above shows, from their peak in 2008, natural gas prices have fallen almost 75%. 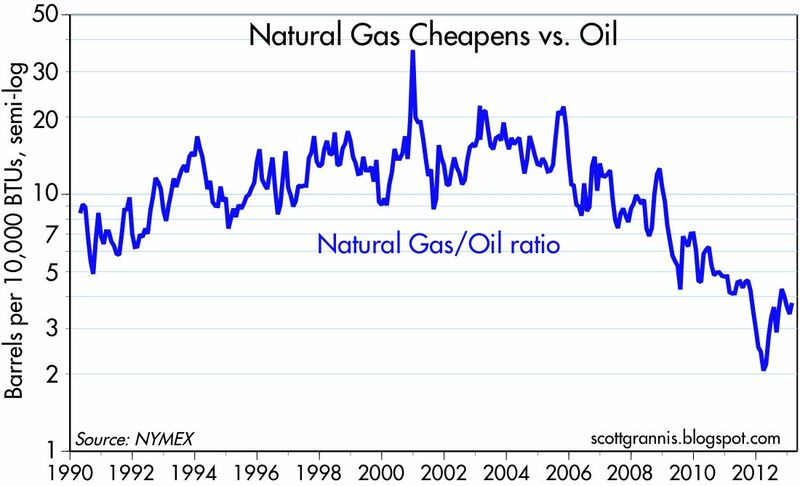 Crude oil is largely fungible and thus determined by global market forces, so its price hasn't fallen much, but natural gas is not easily fungible on a global scale (it has to be compressed and shipped) and so U.S. gas prices have fallen significantly. 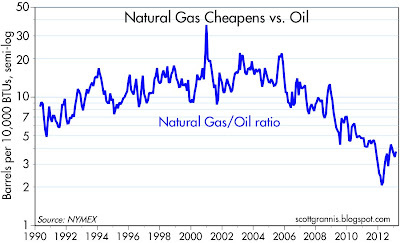 As this next chart shows, natural gas has now become extremely cheap relative to oil. This has given U.S. manufacturers who use large amounts of energy a significant natural advantage relative to those of other countries, not to mention giving consumers in many areas of the country a big break on their heating bills. These are transformative changes in the U.S. economy which are extremely positive for the future. 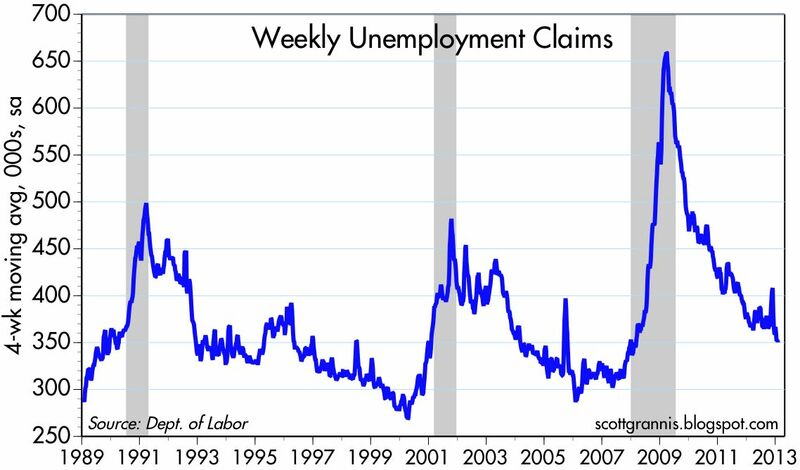 First-time claims for unemployment remain in a downtrend, a clear sign that the fundamentals of the labor market continue to improve. This is the natural progression of any economic recovery, and strongly suggests that the economy remains in recovery mode, however weak it might be. 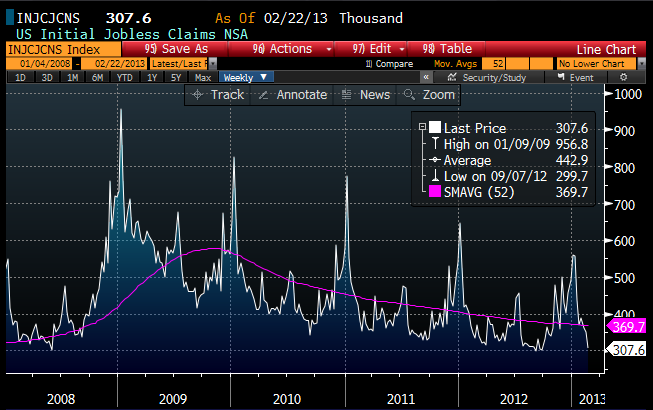 The chart above shows the long-term trend of non-seasonally adjusted claims (white) and the 52-week moving average (purple). The pattern is clearly down, although the rate of decline appears to be slowing—which is natural, since claims are unlikely to ever fall much below 250K per week. At this time of the year, claims haven't been this low since 2007, a year before the recession began. 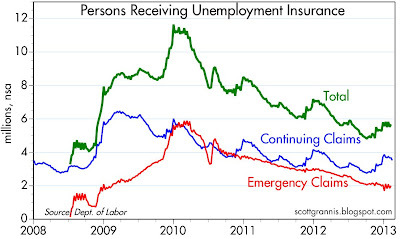 This next chart shows the non-seasonally adjusted number of people receiving unemployment insurance. Over the past year this number has declined by 1.24 million, or 18%. That is a very impressive change, and arguably one of the most impressive changes on the margin in today's economy, because it means that there are more people with a greater incentive to seek out and accept a new job. Changing incentives typically have very important impacts on the economy, and this is one good reason why the economy is likely to continue to improve, however slowly. From the perspective of the market, which is still braced for economic deterioration, the most important thing is not the speed at which claims are falling, but the fact that they aren't rising. There is no sign here that the economy is losing vitality or at risk of slipping into another recession. Therefore, there is little justification for holding substantial assets in cash and cash-equivalent investments that pay virtually nothing, when there is a panoply of alternative investments that yield substantially more. This is one message that the Federal Reserve is trying very hard to beat into the heads of the world's investors. It's a risky gambit, to be sure, because if substantial numbers of economic actors start getting the message, then the demand for cash and cash-equivalents will decline. This would be manifested chiefly in an increased velocity of money (money would circulate faster as people attempted to reduce their holdings of money relative to other things), which in turn would cause nominal GDP to accelerate. Much of this acceleration in nominal GDP could come from a rising price level (i.e., inflation), and too much of this would present a real challenge to the Fed, since they would have to take measures to keep money demand from declining too much. This would entail hiking the interest rate it pays on reserves, ceasing its purchases of Treasuries and MBS, reducing (selling) its holdings of Treasuries and MBS, and/or not reinvesting principal repayments. Treasury yields could rise meaningfully. For the past four years I've been worried about the Fed not being able to respond in a timely fashion to a declining demand for money, and thus allowing inflation to rise. Obviously, those concerns were premature, since inflation has been relatively subdued. 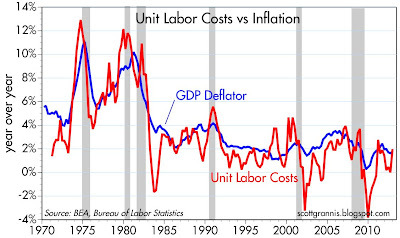 But anyone concerned about an acceleration in nominal GDP, whether or not that meant an acceleration in inflation, would have taken the same steps that would have been appropriate had he or she merely anticipated an economic recovery, no matter how tepid. Since the market has been braced for deterioration for years now, those who have bet on recovery have been rewarded: virtually all risk asset prices are higher, and holders of non-Treasury bonds have been rewarded with substantial interest income in addition to higher prices. I sense that we are now more rapidly approaching the point at which market psychology shifts from being passive/defensive to being more aggressive: from waiting for the train to slow down to get on board, to running to catch the train before it leaves the station. The bond market still expects the Fed to keep short-term interest rates near zero for a very long time, but those expectations could change dramatically, and the Fed's timetable for exiting QE3 could accelerate significantly. Lots of things could change, and in a big way. I'm not sure when, but more and more I think that it pays to be on the side of optimism than on the side of pessimism. At the same time, it makes sense to retain a healthy fear of an unexpected rise in inflation, and that argues for investments in real (tangible) assets that could benefit from faster nominal growth and higher inflation. Real estate and commodity prices top the list of potential beneficiaries. Gold not so much, since I believe it has already risen by enough to anticipate a significant rise in inflation. Gold is very vulnerable to any sign of "good news," which in this case would take the form of an acceleration of the Fed's tightening timetable. That's how I read the latest decline in gold prices, as an early warning indicator of a shift in the Fed's strategy in response to improving economic fundamentals. TIPS, normally considered to be the classic inflation hedge, are also vulnerable, since real yields are very low and negative, and would likely rise if the Fed started raising rates sooner than is currently expected. TIPS investors would benefit from rising coupon payments if inflation exceeds expectations, but they would suffer from declining TIPS prices. In short, TIPS today are very expensive inflation hedges. 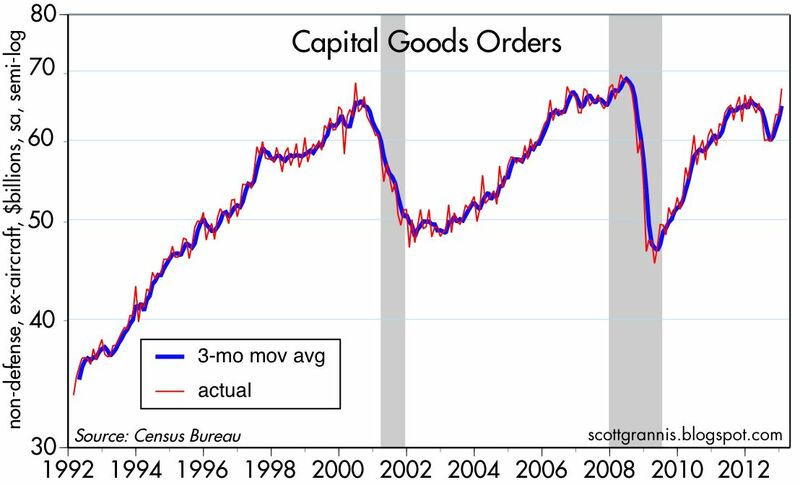 Capital goods orders, a good proxy for business investment, have come roaring back in recent months after a big slump last summer. January orders were up 12.8% from September levels, and they have risen by a decent 4.7% in the past year. A few months ago, this indicator was casting doubt on the economy's ability to continue growing. Now that is no longer the case. 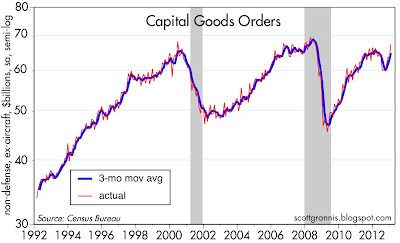 It's probably the case that last year's slump in orders reflected concerns about the looming "fiscal cliff" and the possibility of a significant rise in taxes and/or economic weakness, and that the recent jump in orders is equivalent to a big sigh of relief on the part of businesses that the issue was resolved satisfactorily. This is yet another reminder that my thesis for the past four years still holds: with the market braced for a recession or worse, risk assets are going to rise in price as long as the evidence shows that the economy is not tanking. In other words, the equity rally that is almost four years old now has been driven not by optimism, but by a reduction in pessimism. The future has not turned out to be as bad as was expected. With this market, avoiding recession is all that matters. 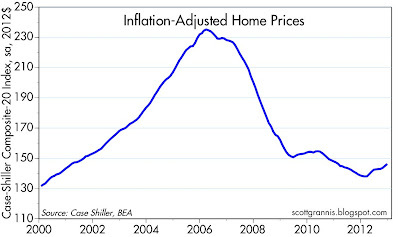 Increasingly, the evidence suggests that the U.S. housing market hit bottom sometime in the past year or two. Housing prices are now on the rise from levels that marked a huge decline from the prior peak. If there are any problems with today's housing market, it is a shortage of homes for sale and the difficulty that many borrowers are having finding financing, due to tighter regulatory guidelines. These two measures of housing prices show that prices rose between 7-12% last year, and are relatively unchanged for the past four years. 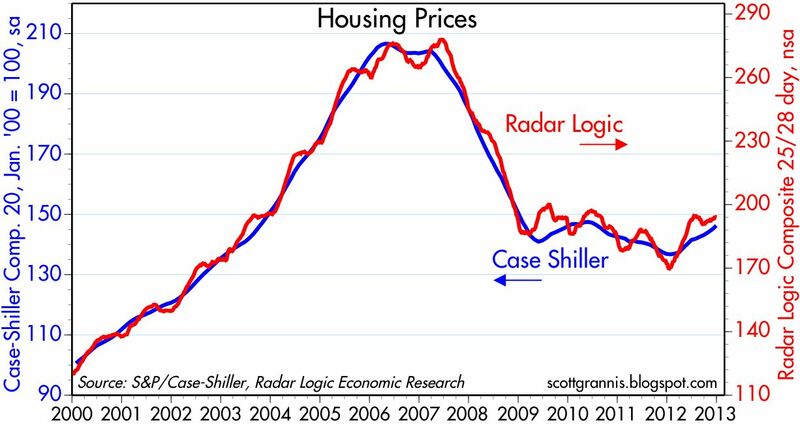 In real terms, the Case-Shiller measure of housing prices rose 5.5% last year, after falling over 40% from its early 2006 peak. 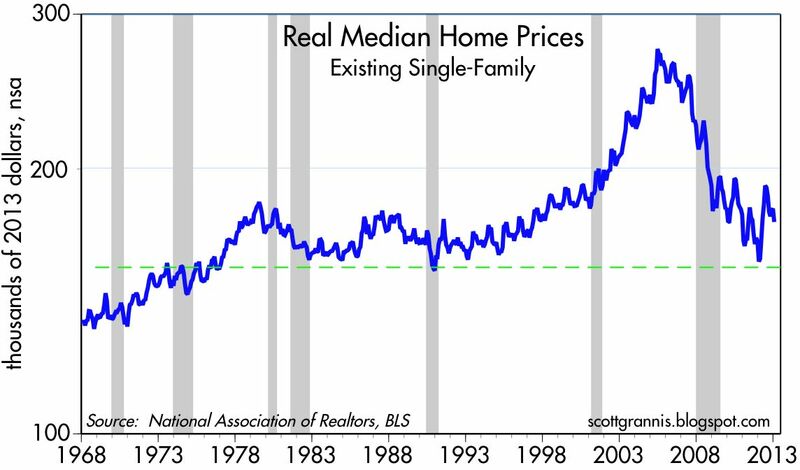 This is how markets clear: as time passes, prices fall until the supply and demand for homes reaches a new equilibrium and prices stop falling. By all measures, there has been plenty of time and price adjustment for this market to clear. We therefore are most likely entering a new phase of the housing cycle, in which prices will tend to rise even as new supply comes on the market. 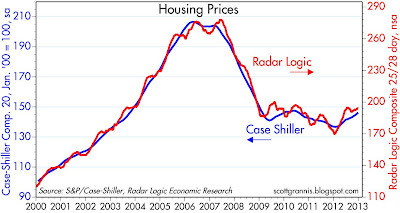 A different version of the Case-Shiller data, going back to 1987 but covering fewer markets, tells the same story. 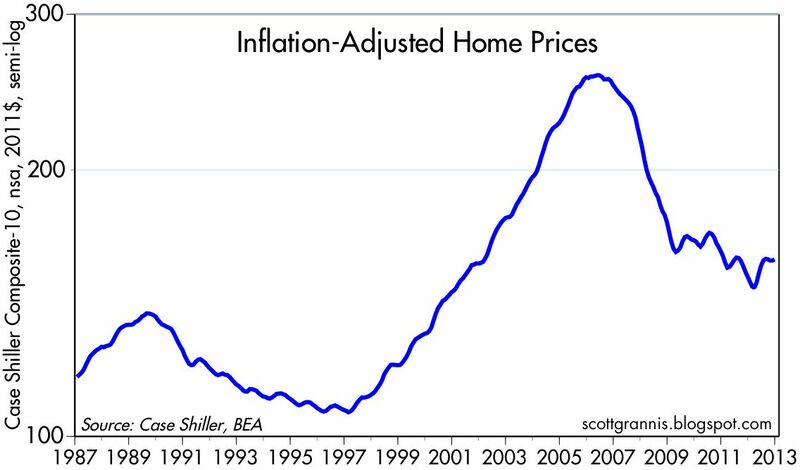 After a huge decline from the 2006 high, inflation-adjusted prices today are only 15% higher than they were in 1989, 23 years ago. 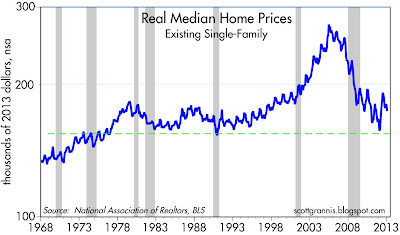 This chart of real median home prices goes back even further and tells the same story. From an historical perspective, inflation-adjusted home prices are only slightly higher today than they were many decades ago, yet interest rates are much lower. 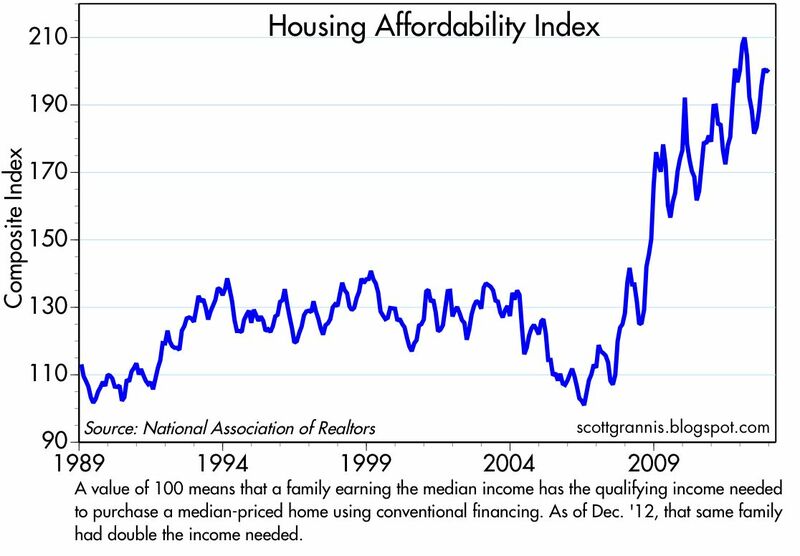 Homes have never been so affordable. As buyers become more confident that prices are not going to fall and are more likely to rise, demand for homes will continue to rise. 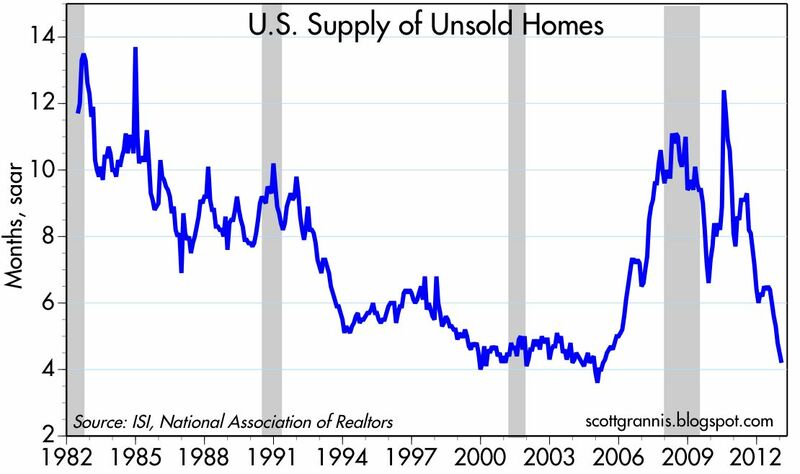 Sellers, meanwhile, will be less anxious to sell as they see that prices are firming. 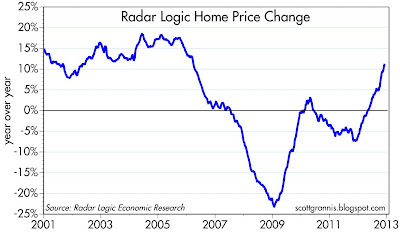 The millions of homeowners who are still "underwater" will also become less anxious about their plight as prices rise. In short, the market has lots of room and time to recover. Housing is now a "sellers' market" in many areas of the country. As the chart above shows, housing prices are much more affordable today than they were in 1989, because real incomes are up and borrowing costs are down. 30-yr fixed rate mortgages were 8% in 1989, and they are less than 4% today. 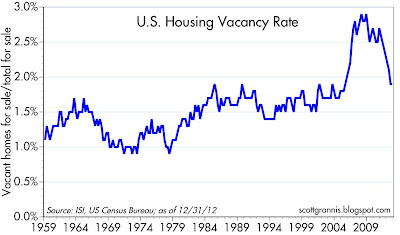 There has been a significant decline in the number of vacant homes for sale. 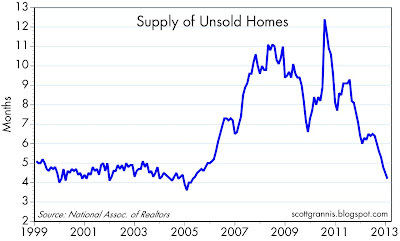 Banks may still be holding back lots of inventory, but what is coming on the market is selling. The vacancy rate today is not unusually high at all, from an historical perspective. 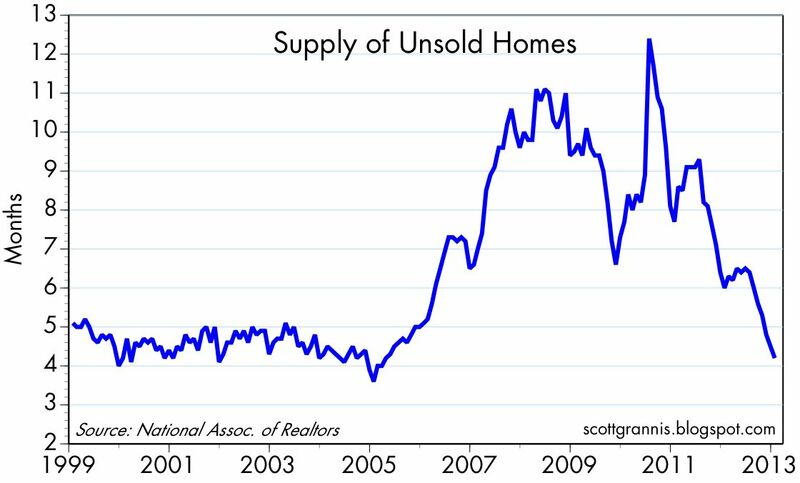 These charts make it clear that there is a shortage of homes for sale. The supply of homes for sale, relative to the current sales pace (which itself is very depressed) is about as low as it has ever been. 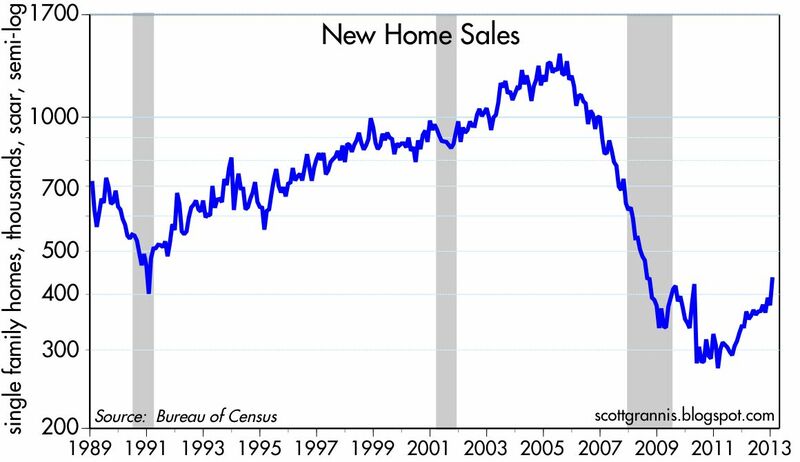 New home sales (today's big news release) were up over 15% from November to December, and they rose almost 30% last year. But they are still extremely depressed compared to the pace of the past two decades. With housing starts up over 60% in the past two years, new home sales are almost certain to post very strong gains this year. A strong housing market is going to provide good support for the economy in the years to come. Bank lending to small and medium-sized businesses continues to expand, up 10.5% in the year ending Feb. 13th. This is a good sign that the economy continues to grow. 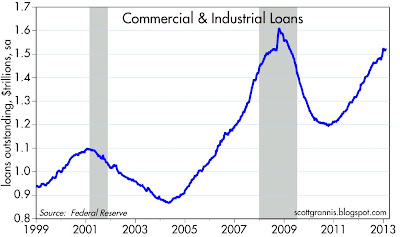 This measure of bank lending to businesses has been rising at double-digit rates for over two years. With banks absolutely flush with reserves, the only constraint on bank lending is a) willingness to lend and b) willingness to borrow. 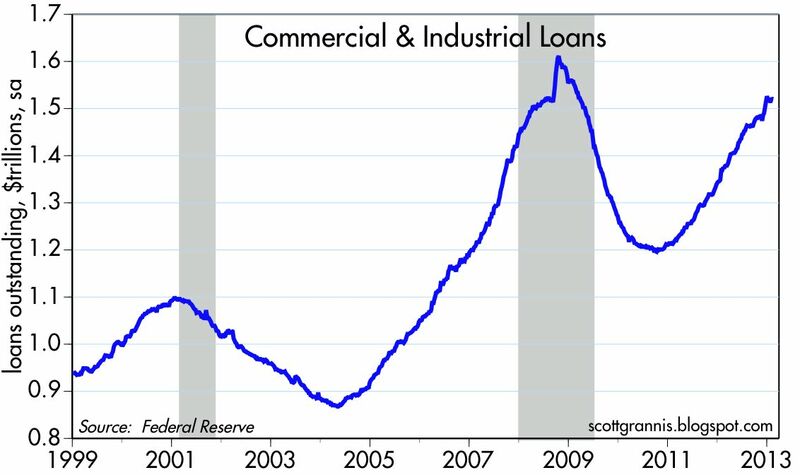 The fact that lending has been rising steadily for over two years is good evidence that banks are more willing to lend and businesses are more willing to borrow. Both suggest rising confidence, and that is the force that is underlying the slow but steady expansion of the economy. 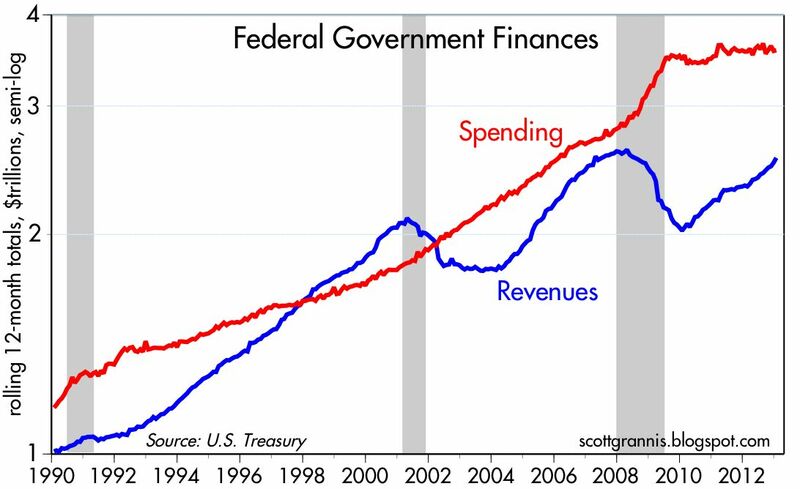 Not the Fed's QE, and not government spending. The growth we are seeing is the result of the private sector healing, not the public sector stimulating, despite what you may read in the papers. The Fed is facilitating the increased lending, by supplying ample amounts of reserves, but not driving it. Truck tonnage in January was up 6.5% from a year ago, strong evidence that the economy continues to expand. 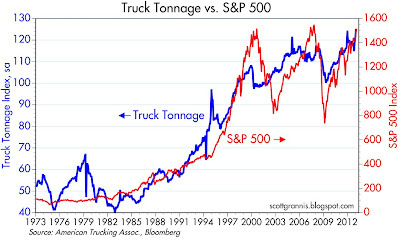 I like this chart because it shows a decent connection between increasing truck tonnage (a good proxy for the size of the economy) and the S&P 500. This is by far from perfect, but it does help flesh out my thesis that the stock market is rising because the economy is growing, however slowly. 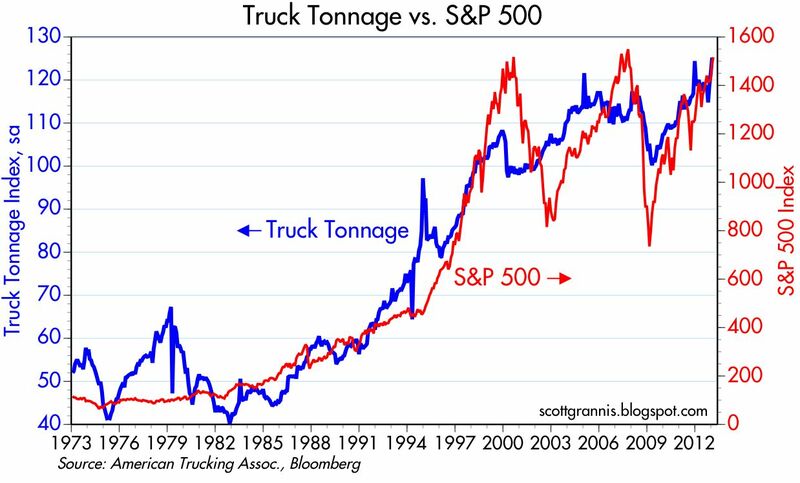 When trucks are moving more stuff around, it's highly likely that economic activity is expanding. I hadn't been watching things very closely the last few days, and so I was shaken to see the market drop amid concerns that the Fed was likely to end its current Quantitative Easing program. But after looking at market fundamentals, I'm reassured that this is nothing more than a "little wall of worry" in the market's long climb to new highs. If the Fed were going to accelerated its tightening timetable, then that should be reflected in a significant rise in 2-yr Treasury yields. The yield on 2-yr Treasuries is driven primarily by the market's guess as to what overnight rates will average for the next 2 years. Yet those yields have not budged on average for the past six months, and in the past few days they have even dropped a few basis points. Swap spreads are still very low and have not budged at all. So the bond market is not worried at all about a tighter Fed. The only sign of concern is the Vix index, which has jumped from 12 to 15, but that's not telling us anything about the economy, only about how worried investors are. And even if the Fed were to begin raising rates sooner than expected, that is hardly a reason to worry. It's more logical to think that would be a good thing, since the Fed's current ultra-accommodative policy stance has created mountains of uncertainty about the future value of the dollar and inflation. Short term rates of 1, 2, or even 3% wouldn't pose a problem at all to the economy if it were a bit stronger than it is today, and there is almost no chance the Fed would raise rates if the economy were truly headed for a fall. In the meantime, all the Fed is doing with its QE program is to swap bank reserves for bonds. 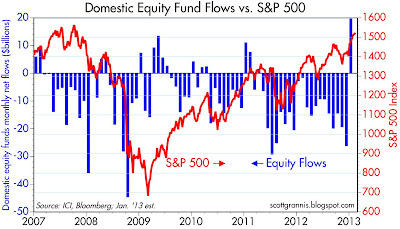 It's not printing money, and it's not directly sustaining the equity market. Banks already have way more than enough reserves to support massive increases in lending. Financial market liquidity wouldn't begin to be adversely impacted until the Fed started aggressively draining reserves, and that won't happen for a long time. What is sustaining the equity market is the realization that the economy is not doing as badly as had been expected. It's still growing, albeit slowly. The yields on non-Treasury securities are very attractive as long as the economy doesn't sink into another recession, and there is no sign of that about to happen. We're going skiing with the family, in what I hope becomes an annual tradition. And in the meantime, if the sequester hits, I won't be worried at all. It's only a very small portion of total government spending, which is already way too big. A little austerity on the spending side is overdue: way past time for the federal government to tighten its belt. The rest of the country has been doing that for years now. 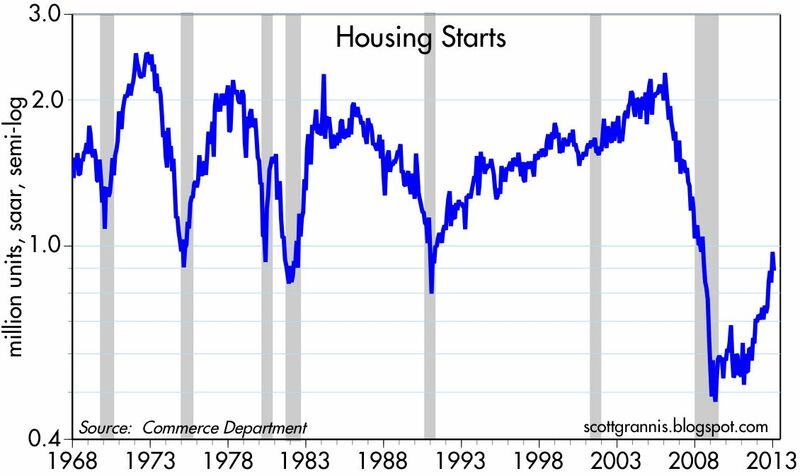 January housing starts were below expectations, but this is a volatile series and seasonal factors can easily distort the month-to-month data around this time of the year. 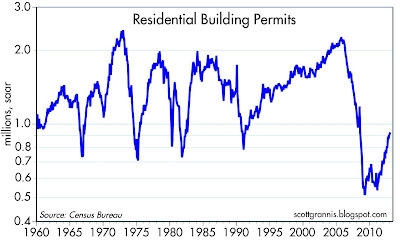 Starts remain in a strong uptrend, and that is confirmed by the ongoing rise in building permits. 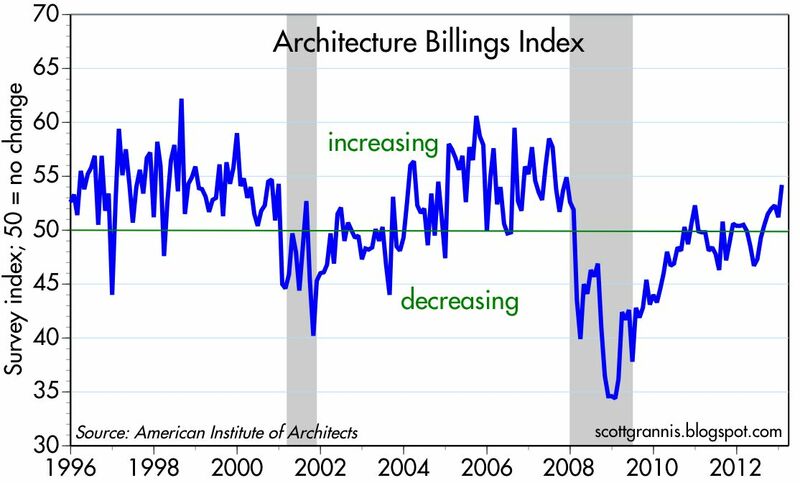 Separately, the Architecture Billings Index for January was very strong. Taken together, it is clear that construction of homes and commercial space is in full recovery mode. Even with the January decline, starts are up 65% from the end of 2010. Historically, starts are still very weak, but the recovery from the abysmal recession lows has been very impressive. Lots of room left on the upside. 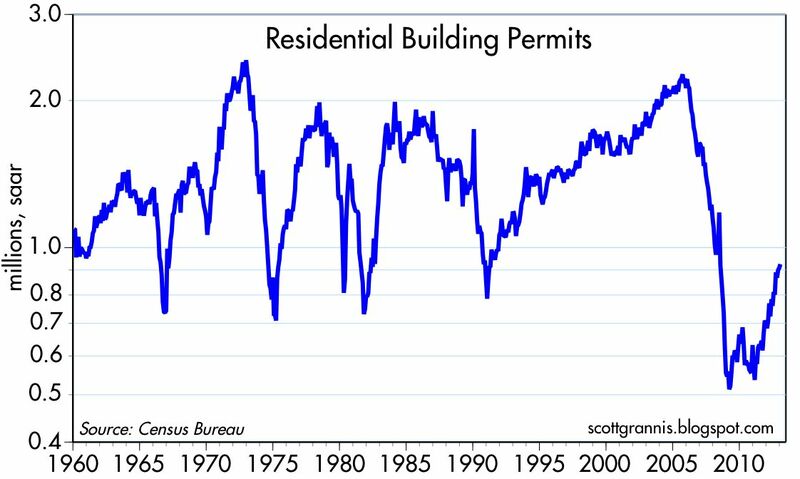 Building permits are less volatile than starts. They are up 65% from Nov. 2010, and they rose a very strong 35% in the year ended January. 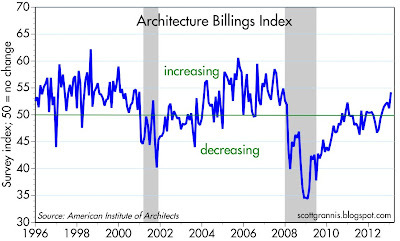 The Architecture Billings Index as hit a new post-recession high. The recovery here has taken a long time to get underway but it now looks like it is on solid ground. 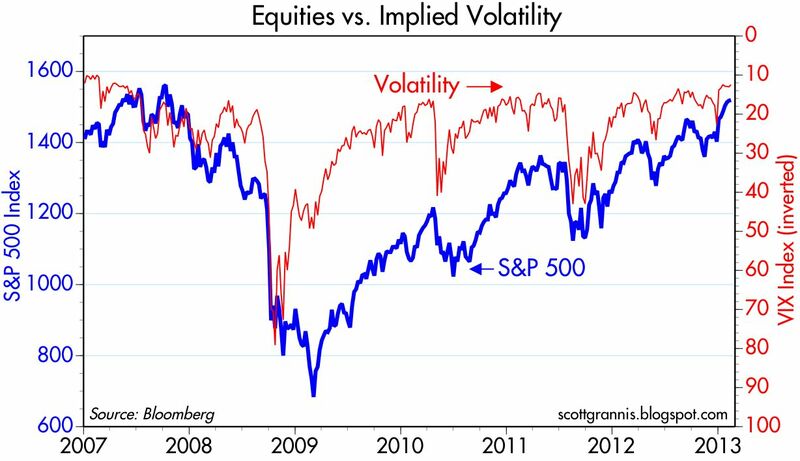 Back in November 2008 I first highlighted the link between the market's fears (using the Vix Index of implied equity index option volatility as a proxy) and the level of the S&P 500, and I've been updating the chart below regularly ever since. It now appears that fear no longer plays an important depressing role in equity prices. 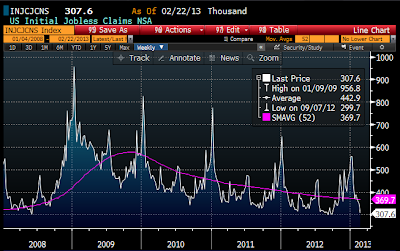 The Vix soared in the latter half of 2008, and that presaged the market's coming collapse. Then as fear slowly faded, in fits and starts, over the past four years, the equity gradually recovered, climbing "walls of worry" all along the way. Now the Vix is almost back to the "normal" levels that prevailed in early 2007, and the S&P 500 is only 3% shy of the high it registered in October 2007. After 5 agonizing years, we've come almost full circle. Does this mean the market is now optimistic? No. I think it means simply that the market is no longer afraid of the future; uncertainty spawns fear, but uncertainty and fear have now declined significantly. Equity prices have risen as fear has subsided; the future has turned out not to be as bad as the market had feared. Now it could be said that while the market no longer fears the future, the market nevertheless is not very optimistic about the future. Fear has been replaced by a confident lack of optimism. The market is in a sense comfortable with the idea that the future is not going to be very bright, and indeed could prove to be rather dull and even quite disappointing. I suspect that, having moved from being obsessed by fear to now being rather confident that nothing much will happen in the future, the market is ready to enter what is likely to prove a period of slowly rising optimism. With nothing left to fear, the market will be forced to focus on the facts. 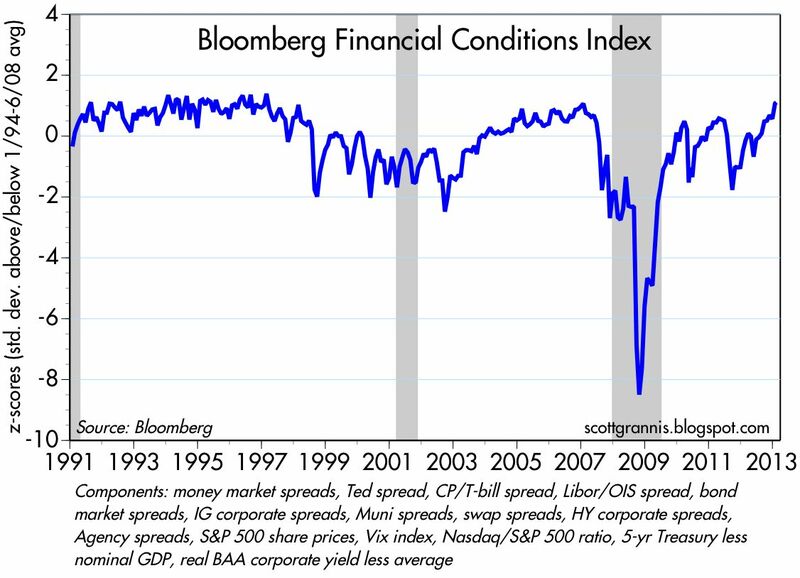 If the economy proves to do better than the market's dismal expectations, then the prices of risk assets can only rise. As I said in a post last month, "avoiding a recession is all that matters." If I'm right, and the economy does avoid a recession, this has enormous implications for financial markets and for the economy. Applying my thesis that fear of the future has been replaced by confidence that the future will be disappointing, here's how I read the market tea leaves today. The yield on cash is essentially zero, 10-yr Treasury yields are a mere 2%, 5-yr TIPS real yields are a miserable -1.6%, and the S&P 500 has a PE of only 15 (equivalent to an earnings yield of 6.6%). That all ties together if you assume the market (in its true collective sense) is confident that the U.S. economy won't be growing much in the years to come. Investors are comfortable owning TIPS and Treasuries at these levels because they don't believe that corporate profits will rise in coming years; indeed, the market is priced to the expectation, I believe, that profits will fall. Why own TIPS with a negative real yield—which guarantees a loss of purchasing power—unless you think alternative investments will deliver disappointing/negative returns? Why keep tons of money in cash (there is almost $7 trillion in bank savings deposits) unless you think that other assets that currently offer much higher yields will decline in price? I suspect that, as long as the economy avoids a recession, and non-cash and non-Treasury investments continue to underperform the returns on risk assets, people increasingly will review their current asset allocation and conclude that they are being too conservative. They are passing up much higher-yielding alternatives because their assumptions about the future have been proven too pessimistic. People then will attempt to move money out of cash and into just about anything but cash: into real estate, corporate bonds, stocks, and commodities. I doubt that gold will be a major beneficiary of this, however, since in my view gold is still priced to something like a calamity occurring (e.g., hyperinflation, global economic collapse). If we instead just experience slow growth then gold will probably decline. The attempt to move out of cash and into riskier assets will cause the price of riskier assets to rise, and their yields to decline. Eventually, the Fed will be forced to raise the yield on cash until market expectations come back into some sort of equilibrium. Some might call this a "market melt-up" scenario. Whereas waves of fear and panic drove equity prices to unbelievable lows in early 2009, the return of optimism could spark reflexive equity purchases that eventually drive prices to unsustainable highs. Domestic equity funds experienced their largest monthly inflow in the past six years, according to preliminary figures tallied by the Investment Company Institute (top chart). 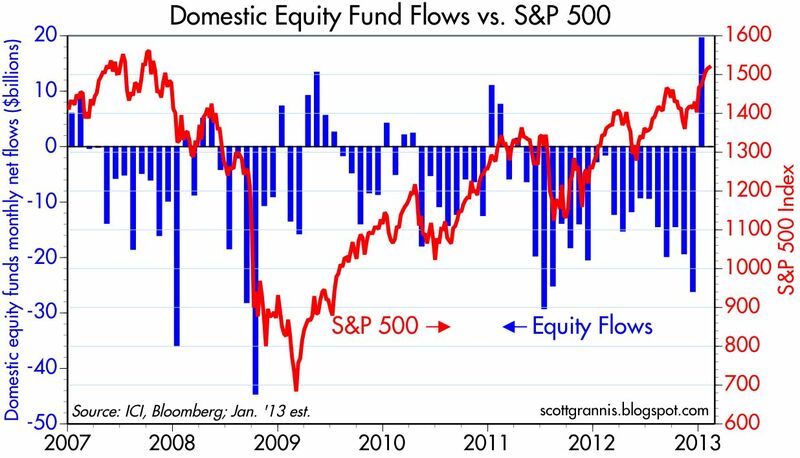 This follows six years during which equity funds experienced huge and almost relentless outflows. Has the tide finally turned? 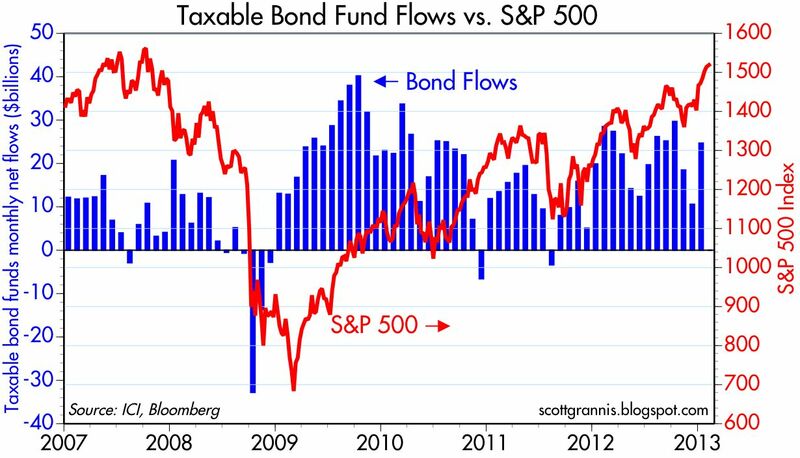 Are investors now finally becoming bullish after four years of strong equity gains? Perhaps, but if this is the beginning of the return of bullish sentiment, it likely has a long way to go before it runs out of gas. The recovery in commercial real estate is now almost four years old. 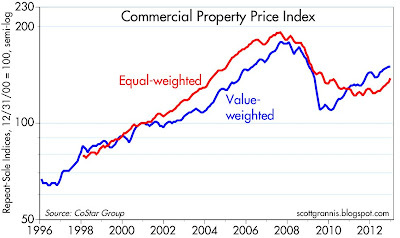 As the top chart shows, commercial property prices are up decisively in recent years. As reported by CoStar, its Value Weighted Index was the first to turn up due to strength in the high-end sector of property market. But now the equal weighted index is starting to catch up, a sign that the recovery is broadening. 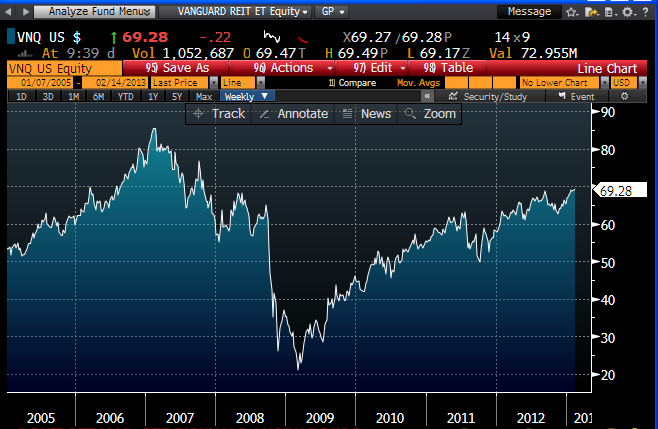 The second chart shows the price action for Vanguard's REIT fund, whose price has risen 215% from its March '09 low. 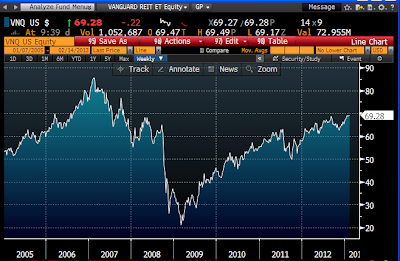 On a total return basis, this fund has trounced the S&P 500, gaining 287% vs. 142% since the March '09 lows. 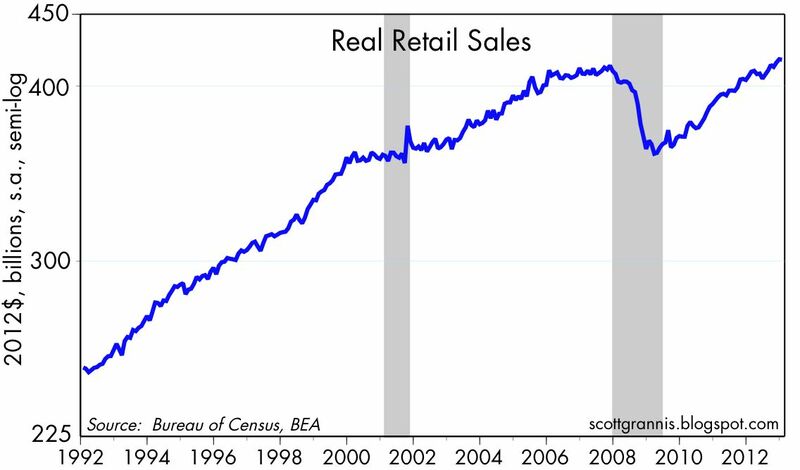 Thanks to panic-induced selling in late 2008 and early 2009, commercial real estate and related prices reached incredibly depressed lows. This represented one of the buying opportunities of a lifetime. If the economy merely avoids another recession, commercial real estate is likely to continue to deliver attractive returns relative to the almost-zero yield on cash. Full disclosure: I am long VNQ at the time of this writing. Initial jobless claims last week were less than expected, but the 4-week moving average (chart above) was roughly unchanged. 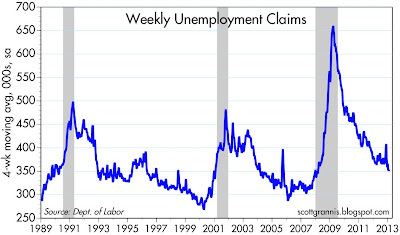 Compared to this time last year, claims are down a little over 5%. 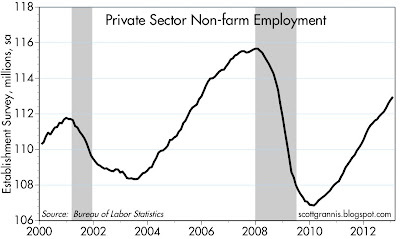 What we have here is a picture of a jobs market that has been slowly but steadily improving for the past four years. There is as yet no sign at all in this very timely indicator of any deterioration in the economy. 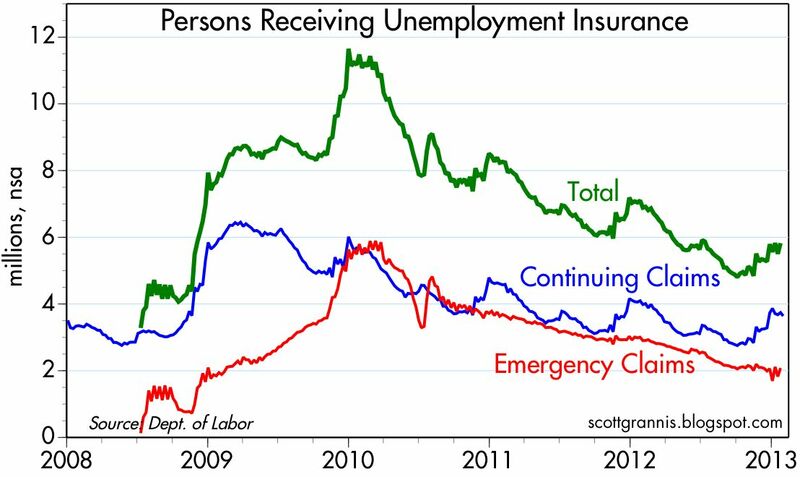 Meanwhile, the number of people receiving unemployment insurance continues to decline significantly on a seasonally adjusted basis. As of two weeks ago (this data comes out with an extra week's delay) there were 18% fewer people collecting unemployment checks than there were a year earlier, almost 1.3 million fewer. This continues to be one of the most significant changes on the margin in today's economy. More and more people have an increased incentive to find and accept jobs, and that brightens the economic outlook. The economy may not be generating a lot of new jobs, but it is most certainly improving and not deteriorating, and that is a powerful message for investors. Why? Because the market in aggregate is still braced for a recession. With guidance and encouragement from the Fed, the market is priced to the assumption that the U.S. economy will be very weak for the foreseeable future, and remains at risk of a relapse. That is the only possible interpretation of 0.27% 2-year Treasury yields, 2.03% 10-yr Treasury yields and -1.63% real yields on 5-yr TIPS. 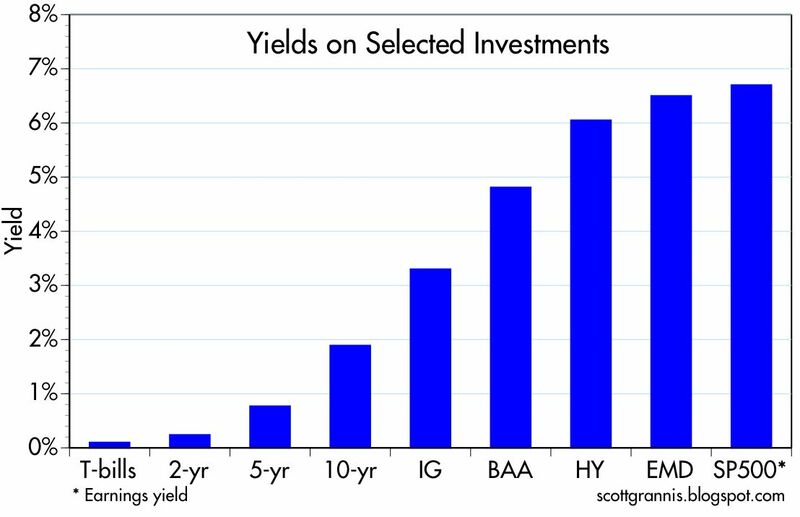 Investors are willing to accept nominal yields that are close to zero and negative real yields on TIPS (which effectively guarantee a loss of purchasing power) because they fear that nominal and real returns on alternative asset classes could be much worse. The Eurozone economy is one source of recession risk, since it has shrunk for the past 5 quarters, and has not experienced any net growth for the past six years. So far, though, weakness in the Eurozone has been more in the nature of a headwind for the U.S. economy than an obstacle to growth. Another potential source of weakness and concern is the looming spending sequester. The actual "cuts" to spending will be almost trivially small, however, and only strike fear into the hearts of committed Keynesians. Supply-siders like me see any shrinkage in the size of government as a reason to cheer, given that spending is still substantially above its long-term average relative to the economy. A smaller government means less "crowding out" of the private sector. It means the private sector will be able to keep more of the money it generates, and that in turn means a more efficient and healthier economy on the margin. As I mentioned last month, avoiding a recession is all that matters. As long as the economy continues to expand, even if only by a little, the returns to owning risk assets will tower over the returns to safe assets like cash, TIPS, and Treasuries. 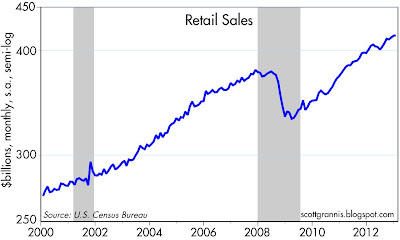 Retail sales rose modestly in January, probably due to the expiration of the payroll tax holiday. Total sales are up 4.4% in the past year; excluding autos, they are up 3.6%. Nothing very exciting going on here, but nothing awful either. 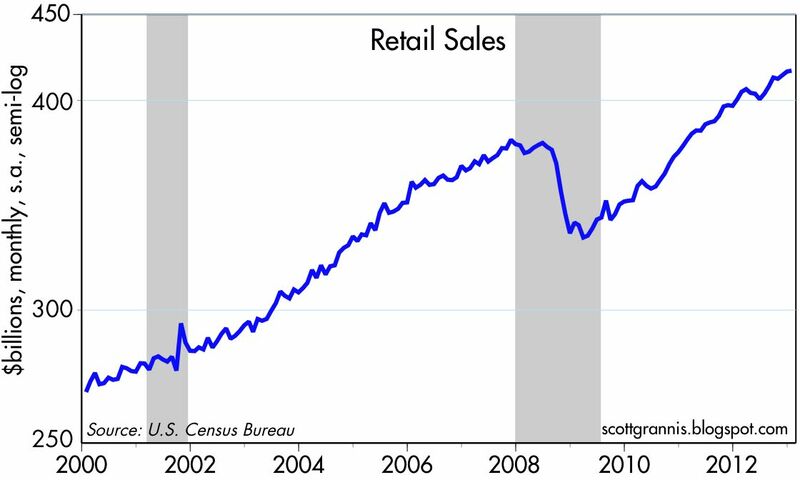 Adjusted for inflation, retail sales have recovered completely from their recession slump, having risen almost 17% from their 2009 low. But they are still well below where they could have been, had this been a normal recovery. 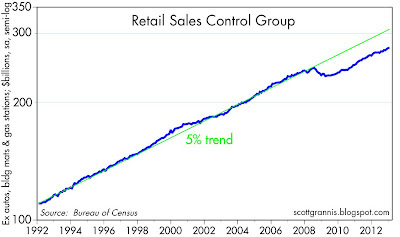 The retail sales "control group" shown in the chart above removes the most volatile items: autos, building materials, and gasoline stations. That makes it easier to see what's happened to sales and the economy. For 16 years sales grew at about 5% per year on average. 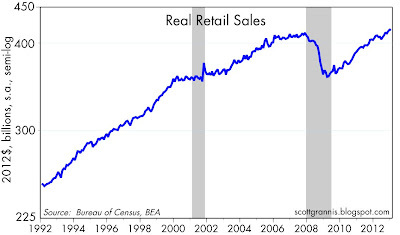 Then came the recession, and sales have yet to recover any of the ground lost relative to their long-term trend. 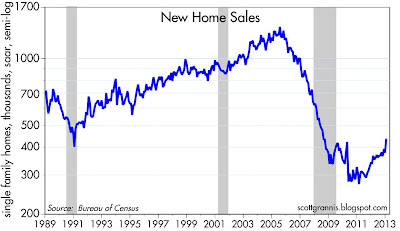 Ever since the recession ended in mid-2009, sales have been about 10% below where they might have been if this had been a typical recovery. 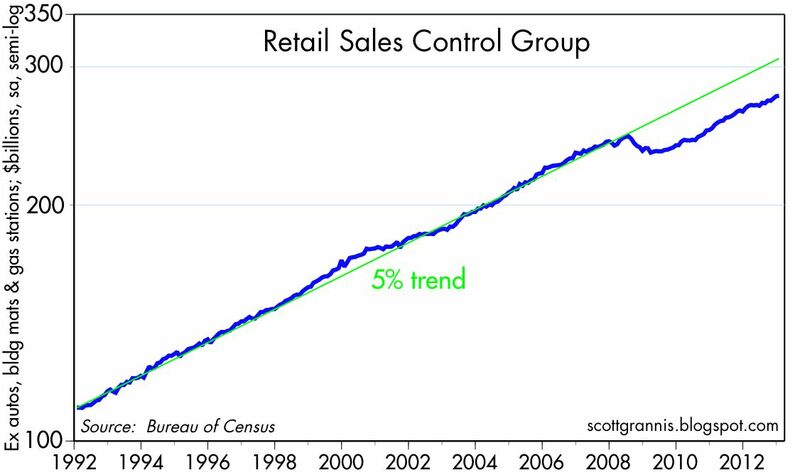 That "gap" amounts to almost $600 billion per year in "lost" retail sales (the control group averages about 65% of total retail sales). 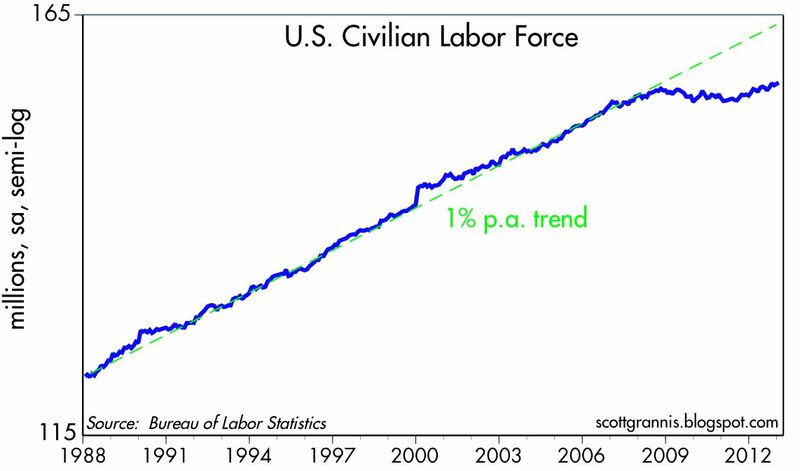 As the chart above shows, one thing that happened to make this recovery different was the loss of roughly 10 million workers from the labor force. For decades, the labor force (those working plus those looking for work) rose about 1% per year, in line with population growth. 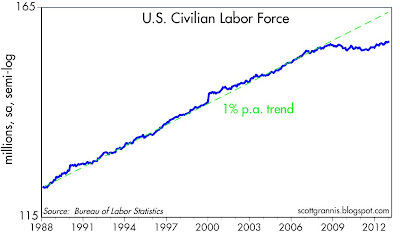 Then came the recession in 2008, and the labor force stopped growing. Today we have about 10 million fewer people in the workforce than we would have had if the 1% long-term trend were still in place. Where did they go? Many undoubtedly just gave up looking, and many of those were probably young and inexperienced workers who were priced out of the market because of increases in the minimum wage. Some became disabled: there are 1.6 million more disabled workers today than there were at the end of 2008. With 16 million more people receiving food stamps today than at the end of 2008, some are finding it a bit easier to give up looking for a job, especially when several family members are collecting food stamps at the same time. With jobs hard to get here, but conditions in Mexico improving (the Mexican stock market is now 35% above its pre-recession high), the U.S. is receiving far fewer immigrants looking for work. The Pew Hispanic Center estimates that net migration from Mexico is now zero or negative. Without immigration to supplement the declining rate of U.S. population growth, our labor force growth cannot sustain its long-term trend. A shortage of immigrants—also the result of our decision to issue no more than 520K immigrant visas a year—is likely a significant and overlooked factor behind our sluggish growth. Reducing or eliminating minimum wage laws and opening our doors to all immigrants willing to work could go a long way to revitalizing the U.S. economy. Giving businesses new incentives to expand could also make a big difference. Reducing or eliminating the corporate income tax could accomplish wonders in that regard. As it is, our corporate income tax is the highest in the developed world. Reducing the tax on business would almost certainly result in more businesses locating here and expanding. More businesses and more opportunities likely would entice millions to re-enter the labor force. 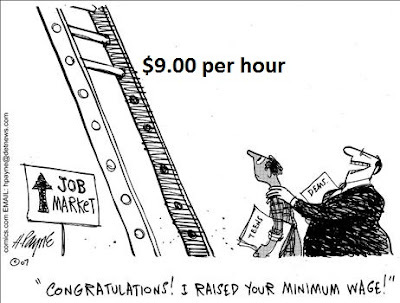 This is the best illustration I have ever seen of the fundamental problem with government setting a "minimum wage." As Mark Perry notes in a fascinating post on the subject, only about 2% of the 135 million people with jobs today earn the minimum wage or less. If the minimum wage is set too high, then younger and inexperienced workers never get a chance to work, because employers can't afford to hire someone that is expensive but has no experience or talents or a track record of success. UPDATE: Keith Hennessy adds some meat to this argument. 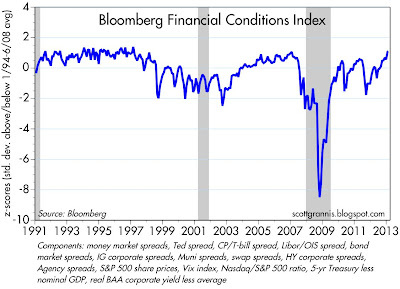 Bloomberg's Financial Conditions Index is now at a post-recession high. This index incorporates a variety of measures of market liquidity, credit spreads, implied volatility, systemic risk, and equity performance. These are important economic and financial market fundamentals, and they thus augur well for the future health of the economy. One of the great, largely-untold stories of the past three years is the ongoing and substantial improvement in the federal budget. 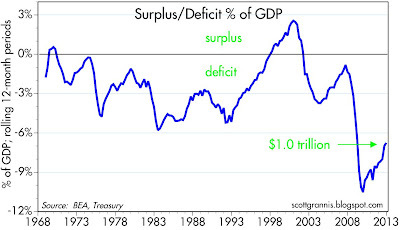 Thanks to very slow growth in spending and a decent rise in revenues, the budget deficit has declined from a high of $1.47 trillion in late 2009 to $1.03 trillion in the 12 months ended January 2013. 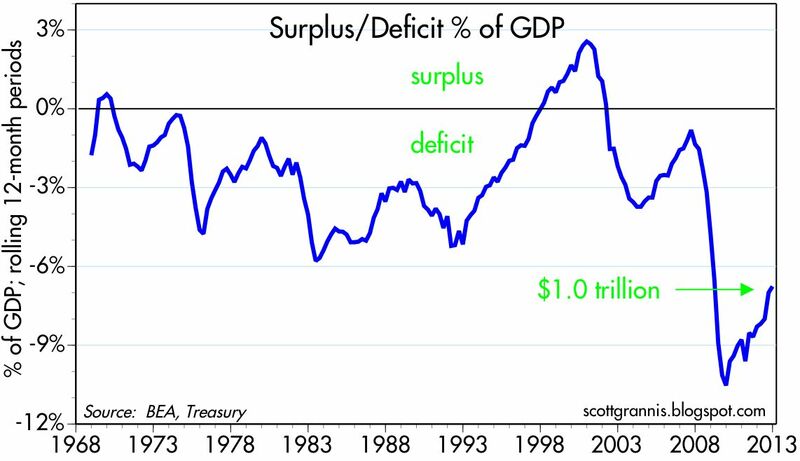 Relative to GDP, the deficit has dropped from a high of 10.5% to 6.7%. This was achieved despite no increase in tax rates (and in spite of a 2-year payroll tax holiday), despite no announced budget cuts, and despite the Senate not having once passed a budget. Three cheers for Congressional gridlock, and a hearty "well done" to an economy that has managed to grow despite all the headwinds it has faced! Looked at another way, the burden of the federal deficit has dropped by a very impressive 36% in the past three years. 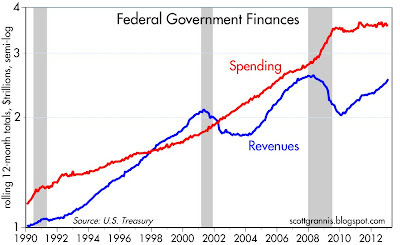 More important, perhaps, is that the burden of government spending has dropped by 10% over the same period. These rank as significant improvements in the underlying economic fundamentals of the economy, since they allow the private sector to keep more of its earnings. The private sector is much better at spending money than the government, so getting government out of the way and out of our pockets is a good thing. Over the past year, federal revenues have grown by over 9%, mainly because the economy has been adding jobs. Even taking into account the surge in revenues in December, which was driven in large part by accelerated income and dividend payouts designed to avoid the threat of higher taxes in 2013, revenues had been rising at a 7-8% pace for most of last year, while spending in the 12 months ended January 2013 was up only 0.4%. If current trends were to continue, the budget would be balanced within 7 years or so, without the need for budget cuts or higher taxes. The problem, of course, is that these trends are not likely to continue, unless we get real healthcare and entitlement reform. Healthcare costs are going to rise enormously if and when Obamacare is implemented, and social security benefit payments are going to outstrip receipts unless the retirement age is increased, benefit increases are limited to the increase in inflation, and payouts are means-tested. But for the time being, things are getting better, and that's good news that is not widely understood. Trade data for December was somewhat better than expected. This, combined with stronger data on construction and inventories, will likely boost Q4/12 GDP from -0.1% to a small positive gain. But stepping back from the recent numbers, what stands out to me is the incredible progress that the U.S. economy has made in the past 20 years on the international trade front. In 1992, imports and exports of goods and services both represented about 7-8% of GDP. 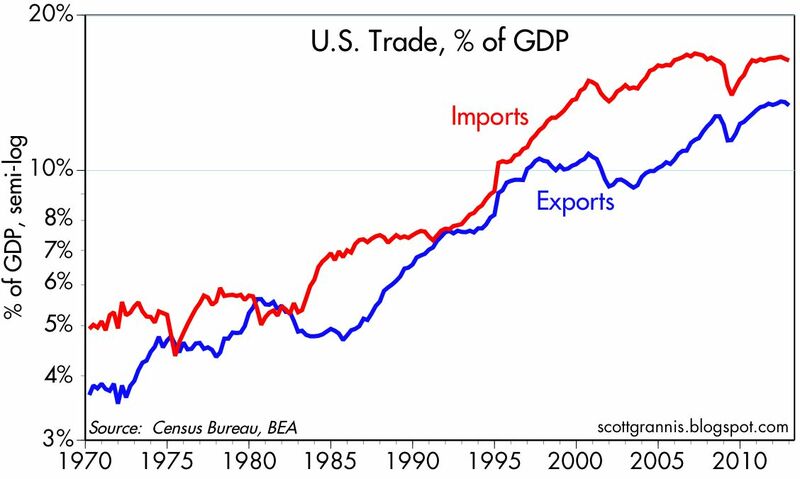 Since that time, exports have grown to over 13% of GDP, and imports to over 16% of GDP. Exports, in other words, have grown 75% more than GDP, and imports have more than doubled relative to GDP. The U.S. economy is finally becoming globalized, like most of the world's other major economies. The growth of international trade is an unqualified good thing, for us and for the rest of the world. It makes economies more efficient and boosts standards of living everywhere. The more the better. This is one of the reasons why it doesn't pay to underestimate the ability of the U.S. economy to overcome adversity. Today we learned that productivity fell at a 2% annual rate in the fourth quarter of last year. From a peak of 5.6% in 2009, it is now up only 0.6% in the past year. This fits with the slowdown in growth in the past two years—companies have squeezed about as much out of existing resources as they can. Without a faster pace of hiring and more investment in productivity-enhancing equipment, technology, and training, the economy's growth is going to be constrained to the current growth rate in jobs plus productivity gains of maybe 1% a year, and that in turn suggests we could see only 2-2.5% annual real growth going forward. The above chart compares the 2-yr annualized growth of productivity (to minimize the typical quarterly volatility of this series) to the year over year change in the GDP deflator, the broadest measure of inflation. There is a relative strong tendency for the two to be inversely correlated. 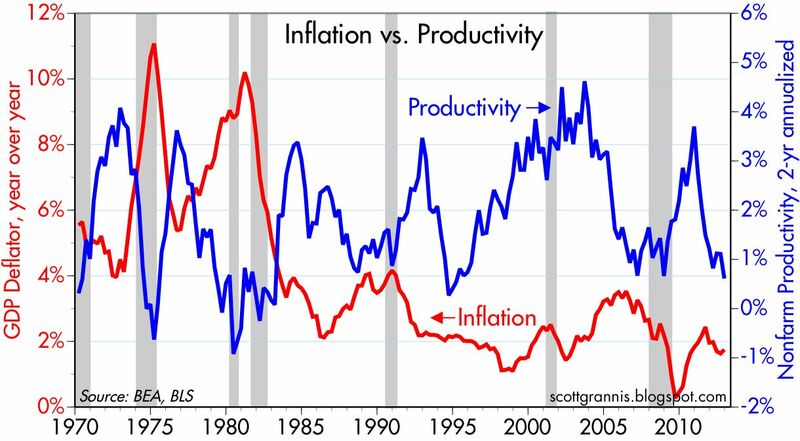 Strong productivity tends to coincide with low inflation, and weak productivity gains with higher inflation. 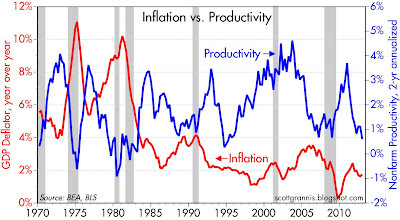 If the bloom is indeed off the productivity rose for the time being, then this chart suggests that we could see somewhat higher inflation in coming years. 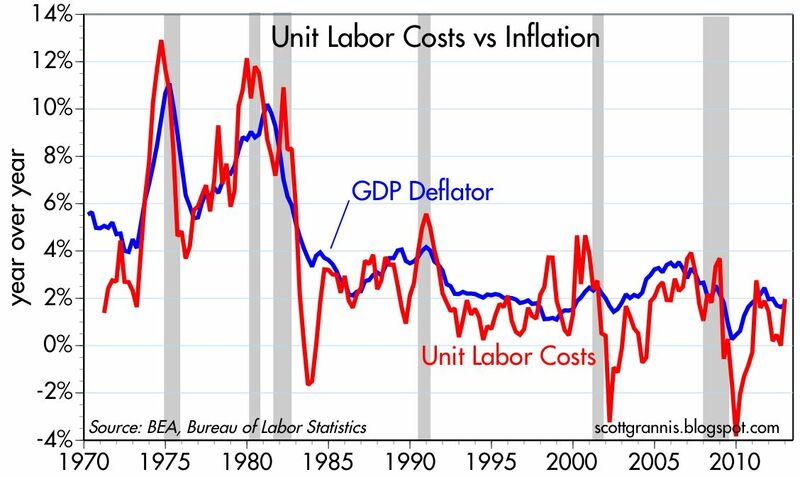 Looked at another way, the decline in productivity means that unit labor costs are rising and could now begin to feed through to higher prices. John Taylor wrote a very interesting article in the WSJ last week, "Fed Policy Is a Drag on the Economy," in which he argues that the Fed has been hurting the economy by keeping short-term interest rates extremely low, and promising to keep them extremely low for a long time. This of course runs directly counter to what we have been led to believe. He describes a variety of problems created by super-easy monetary policy (e.g., encouraging people to take on too much risk, creating great uncertainty about the Fed's ability to reverse its QE efforts, making it easy for the federal government to fund its massive spending plans, and forcing other central banks to follow suite.) More importantly, perhaps, he argues that very low interest rates create disincentives to save, and this limits the economy's ability to grow. "While borrowers might like a near-zero rate, there is little incentive for lenders to extend credit at that rate. ... lenders supply less credit at the lower rate. The decline in credit availability reduces aggregate demand, which tends to increase unemployment, a classic unintended consequence of the policy." In other words, while everyone, including the Fed, thinks that ultra low interest rates provide an important source of stimulus to the economy, it's quite likely that they do just the opposite. The Law of Unintended Consequences strikes yet again! Taylor had a somewhat-related blog post the other day in which he discusses the "strong inverse relationship between fixed investment and the unemployment rate." He accompanied the post with a chart that got my attention, because I saw a way to improve it. The above chart uses the same data as Taylor's original chart, but includes data going back to 1960 (his only went back to 1990). The interpretation of the chart remains the same. 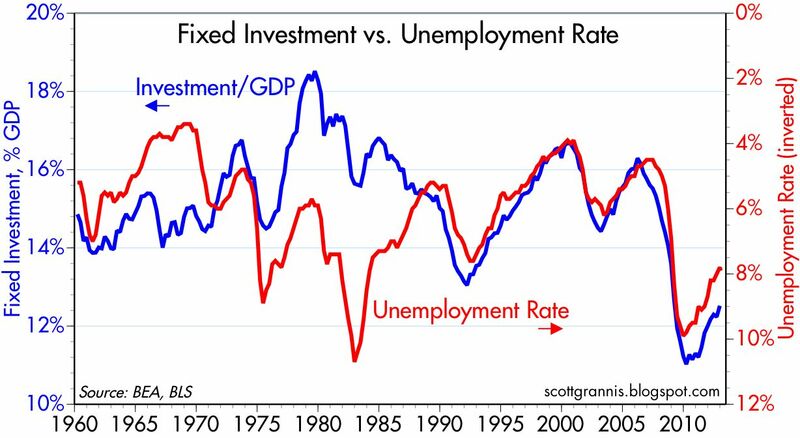 There is a strong inverse relationship between fixed investment as a share of GDP (fixed investment includes private residential and nonresidential construction, and private investment in equipment and software) and the unemployment rate, which is a good proxy for the health of the economy. He is careful to note that while the correlation is strong, we cannot infer the direction of causality. But this does illustrate how a lack of investment could go a long way to explaining why the recovery has been so weak. It then occurred to me to put his two ideas together, to see if the Fed's monetary policy was correlated with the amount of fixed investment. 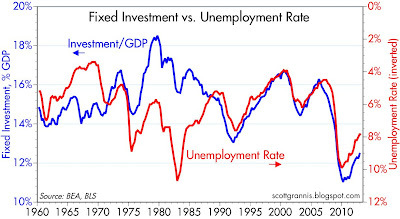 Where Taylor's WSJ article focuses on how artificially low interest rates limit lending and therefore aggregate demand, and his chart compares fixed investment to the unemployment rate, I wanted to see if there was a link between Fed policy and fixed investment. 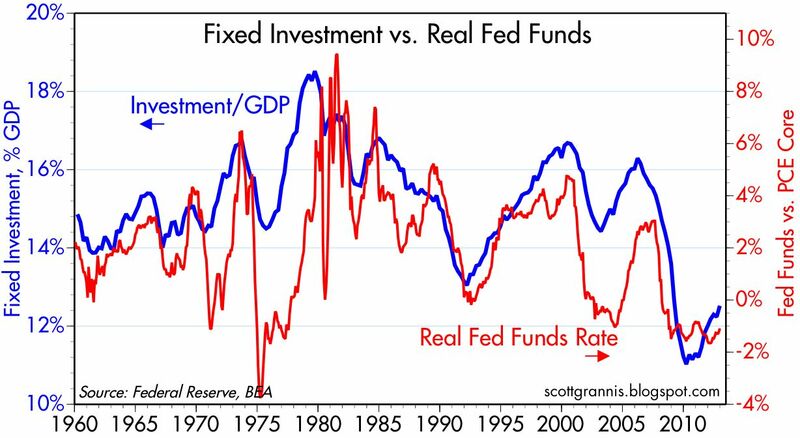 As the chart above shows, Fed policy is indeed highly correlated to fixed investment (even more so than the unemployment rate is). 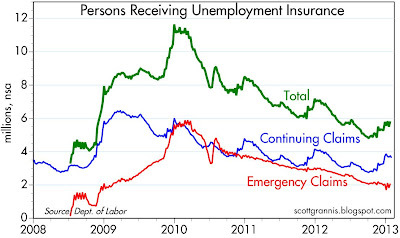 This fits hand and glove with the first chart, which links fixed investment to the unemployment rate. The red line in the above chart is the real Federal funds rate (using the Core PCE deflator), since that is a good proxy for the degree to which monetary policy is "tight" or "easy." This puts some meat on the bones of Taylor's WSJ article. 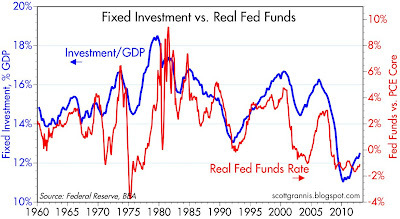 The Fed's unusually accommodative monetary policy stance, which promises extremely low interest rates (negative in real terms) for a long time to come, does appear to be a factor in limiting the amount of funds available for investment, and in reducing aggregate demand, and that in turn helps to explain why the recovery has been so weak. How else to explain the fact that fixed investment is almost always very strong when monetary policy is very tight, and weak when monetary policy is easy? How else to explain how a decade of extremely low interest rates have failed to stimulate Japan's economy? 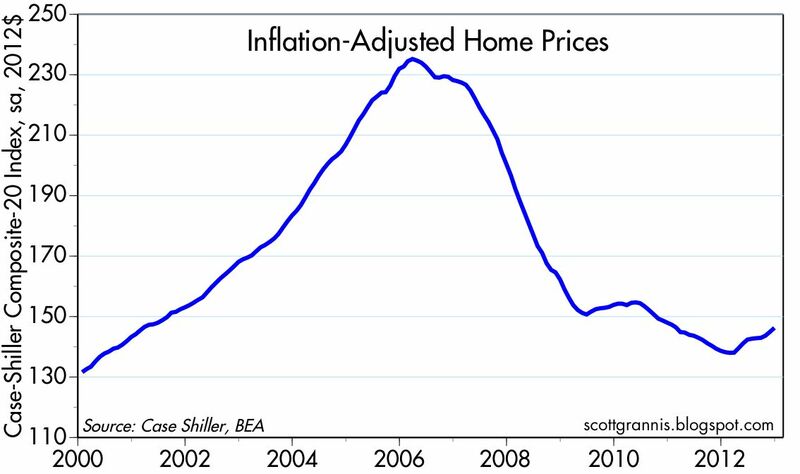 Based on the chart above, it looks like the best that can be said for housing prices is that they have been relatively flat over the past four years. 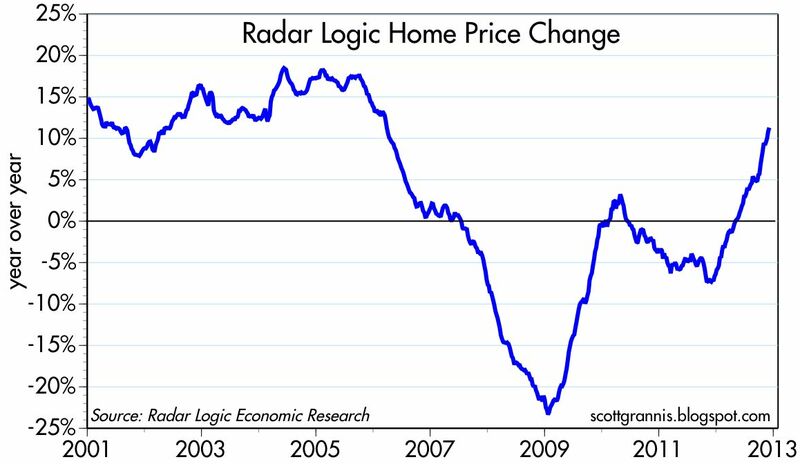 But as this chart shows, housing prices as measured by the Radar Logic folks (quite similar to the CoreLogic data Mark uses) are up over 10% in the past year. We haven't seen anything like this for a very over six years. To better appreciate what is going on, I offer the above chart, which compares the Radar Logic price index in 2011 (orange) to the index in 2012 (white). Instead of following their normal seasonal pattern (in which prices tend to fall from summer through winter), prices last year didn't fall at all. 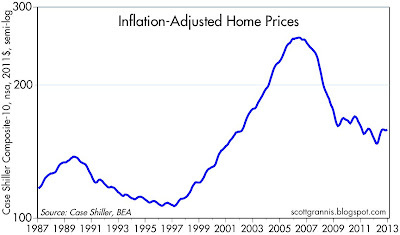 On a seasonally adjusted basis, therefore, prices are up significantly. This is a very important change on the margin. One of the key characteristics of today's housing market is a shortage of homes for sale. 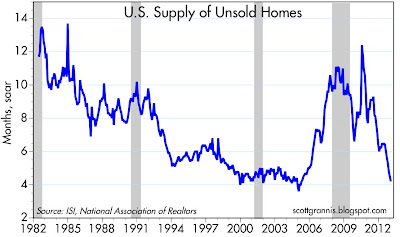 As this chart shows, the inventory of homes for sale is about as low as it's ever been. Presumably, the recent strong price action will convince banks and homeowners who were reluctant to sell at depressed prices to put their properties on the market in the coming months, which are traditionally the strongest for housing sales. If they don't, prices could rise even more. Opinion polls and gauges of investor sentiment have their limitations, because they can only sample a fraction of the people making real decisions. Market prices, on the other hand, reflect the best judgment of everyone who cares. In the case of TIPS and Treasuries, there are many millions of individuals and investors around the world who care very deeply about their prices. Indeed, it could be argued that the owners of many tens of trillions of dollars of securities around the world care deeply about the prices of TIPS and Treasuries, because the vast majority of the world's bonds are priced off of the Treasury curve. Since growth and inflation are the two most important drivers of TIPS and Treasury yields, it's reasonable to think that their pricing can accurately reveal the market's assumptions about the future of economic growth and inflation. The charts that follow illustrate a few ways to interpret the message of TIPS and Treasuries. 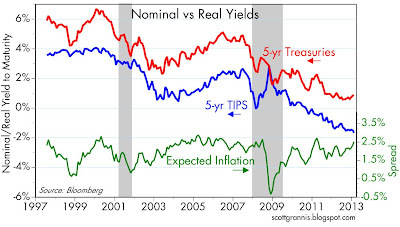 Comparing the real yield on TIPS to the nominal yield on Treasuries of comparable maturity reveals the market's inflation expectations. The above chart shows the nominal yield on 5-yr Treasuries (red), the real yield on 5-yr TIPS (blue), and the difference between them (green), which is the market's implied or expected annual inflation rate over the next 5 years. Note that over the past several months, nominal yields have turned up a bit, and real yields have continued to decline. Thus, the expected inflation rate has increased of late. Why? 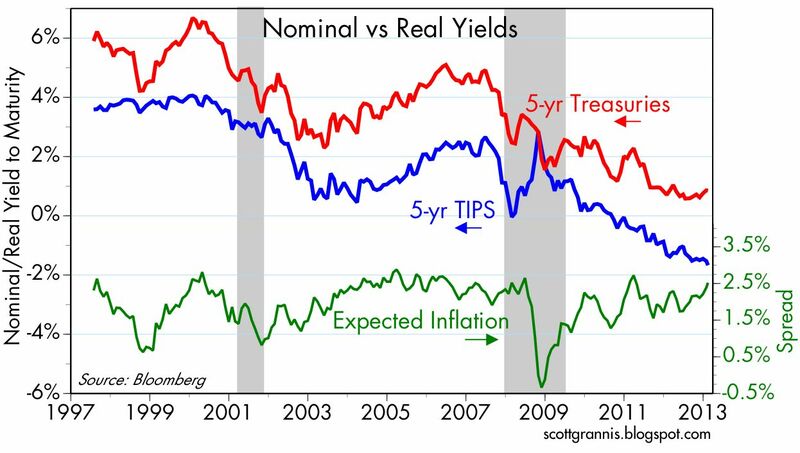 Demand for TIPS has increased (thus pushing their real yield lower), at the expense of Treasuries, because investors increasingly fear higher inflation. 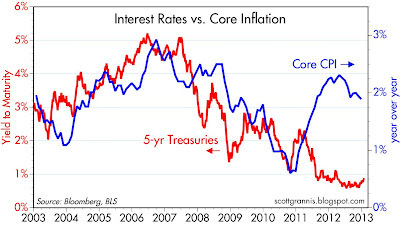 TIPS benefit from higher inflation because their nominal yield rises as inflation rises, but Treasuries, of course, suffer from higher inflation because their inflation-adjusted yield declines. If we look at the long-term picture, nominal and real yields have tended to move together, and expected inflation hasn't changed much on average over the past 15 years. Currently, though, it is near the high end of its range. In other words, while inflation expectations have increased on the margin in recent months, they are not excessively high. But consider this: since inflation currently is running in the range of 1.5-2%, and it is expected to average 2.5% over the next five years, that implies that the market believes that inflation will accelerate meaningfully in the next several years, possibly reaching 3 or 4% at some point. 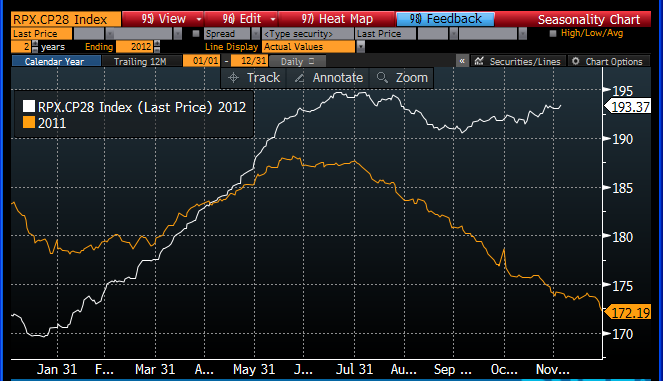 The level of real yields on TIPS reveals a lot about the market's expectations for real economic growth. 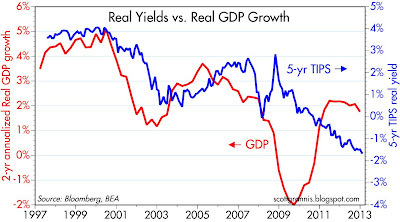 The chart above compares the real yield on 5-yr TIPS with the 2-yr annualized real growth of GDP. Although the correlation between these two is not very tight, we do see that real TIPS yields have declined as the pace of economic growth has slowed. The chart suggests that the current level of TIPS yields is consistent with expectations for real growth of 0-1% over the next few years. In other words, the very low level of real yields on TIPS is telling us that the market is very pessimistic about the prospects for economic growth in coming years. 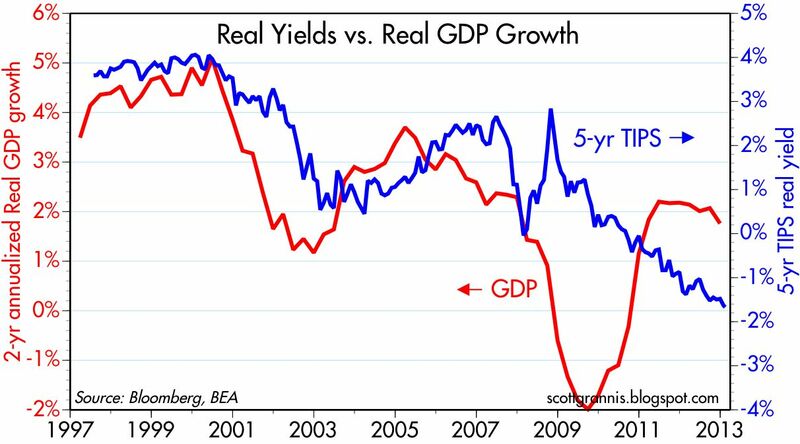 It also makes sense that real yields on TIPS should be in the same neighborhood as real economic growth, because there is a fundamental arbitrage between the two. Strong real growth should feed through to strong returns on equities, and weak economic growth should feed through to weak returns on equities. I note that both Treasuries and equities are priced to relatively weak growth expectations: the PE ratio on the S&P 500 is currently about 15, which is below average, despite the fact that corporate earnings are at record highs. 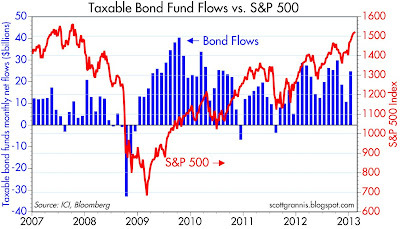 The bond and equity markets are in synch on the question of expected growth. I've written more on this subject here. But aren't Treasury yields being manipulated by the Fed, and doesn't this distort the message of TIPS? I don't believe so. The Fed currently owns about $1.7 trillion of Treasuries, and that is only 15% of the Treasuries held by the public. Furthermore, only $76 billion of that amount (4.5%) are TIPS. TIPS and Treasuries owned by the Fed represent a very small fraction of total TIPS and total Treasuries, not nearly enough to allow Fed purchases to distort their prices. 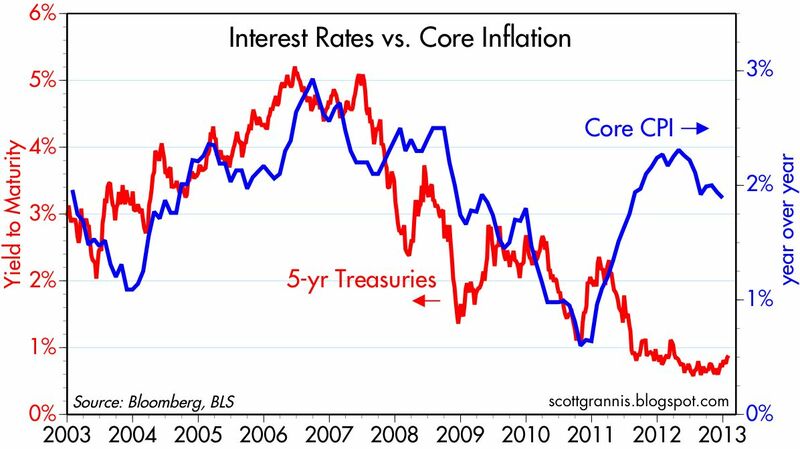 The chart above compares the nominal yield on 5-yr Treasuries (red) with the year over year increase in the Core CPI. The correlation between the two was fairly tight during most of the period shown in the chart, and that correlation tends to hold over longer periods as well. 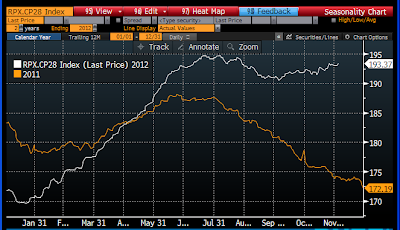 Beginning in early 2011, however, the two began an important divergence: Treasury yields fell but inflation rose. This divergence had very little to do with the Fed's Quantitative Easing program, despite what many may say to the contrary. The Fed started buying Treasuries in the third quarter of 2010 and stopped at the end of June 2011, and Treasury yields barely budged on net for the period. From mid-2011 until just a few months ago, the Fed was not buying any Treasuries on net, and yields were roughly unchanged. 5-yr Treasury yields are essentially the market's estimate of what the average return on overnight interest rates (e.g., the Fed funds rate) will be over the next five years. If the market believes that the economy will be very weak for at least the next several years, then the market also believes that the Fed will, as promised, keep short-term interest rates very low for a long time. The Fed can't manipulate 5- or even 10-yr Treasury yields, but it can influence the market's expectations, provided the market believes that the Fed's announced intentions are reasonable given the outlook for growth. In short, both Treasury and TIPS yields are very low today—despite being unusually low relative to inflation—because the market is convinced that the prospects for U.S. economic growth are dismal, and the market is willing to pay a very high price (in the form of very low yields) for the safety of Treasuries. To sum up, the message of TIPS and Treasuries is that the market expects very weak growth in the next few years, along with rising inflation. This is significant, because it runs directly counter to the traditional Keynesian/Phillips Curve way of thinking, which holds that very weak growth—especially when growth is substantially below potential growth as it is today—should produce a decline in inflation. The bond market has cast aside its Keynesian predilections. And everyone by now should have lost faith in the Keynesian theory that holds that big increases in government spending, financed with deficit spending, are stimulative, and in the Keynesian theory that holds that the Fed has the ability to stimulate growth by keeping real interest rates low. The past four years have been a valuable lesson in why this is all nonsense. Government bureaucrats who think they can pull levers and micro-manage growth and inflation are fooling themselves and doing us all a disservice. This is good news. Ultimately, markets figure things out. Now we just have to get the message to the politicians. Note to readers: this analysis is meant to reveal what the market's expectations are for growth and inflation. This is not my view of what is going to happen. I continue to believe that the economy will manage to do better than expectations, even if it only results in disappointingly slow growth of 2-3%. And even though inflation has not picked up as I thought it would, I continue to worry that it will pick up, and significantly so. That doesn't translate into a recommendation to buy TIPS or gold, however, since they are very expensive inflation hedges at this point. I think equities and real estate are the better choice, since they are still attractively priced and ought to benefit from stronger-than-expected growth and higher-than-expected inflation. 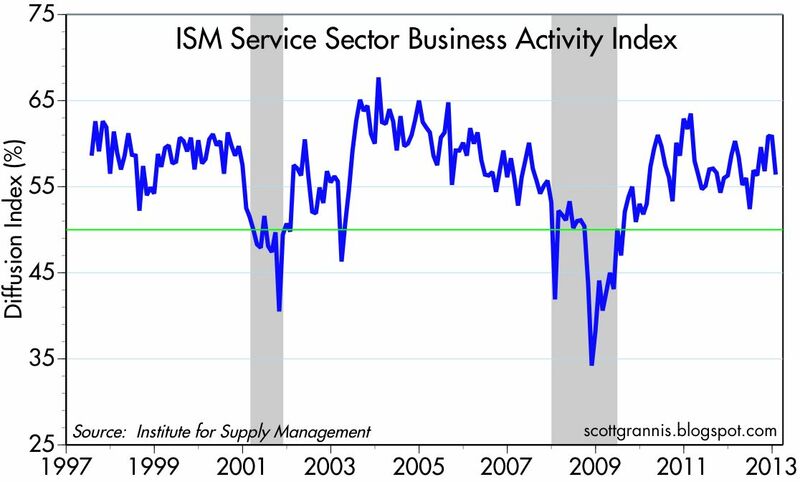 The January reading of the Business Activity Index is consistent with moderate growth, steady as she goes. 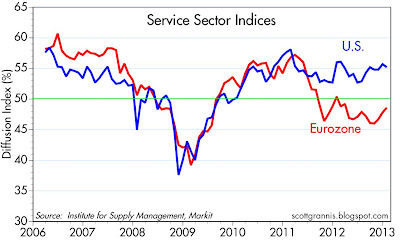 The uncertainties surround the "fiscal cliff" late last year appear to have had little impact on the service sector. 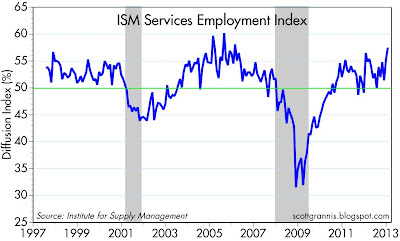 The January Services Employment Index was surprisingly strong. 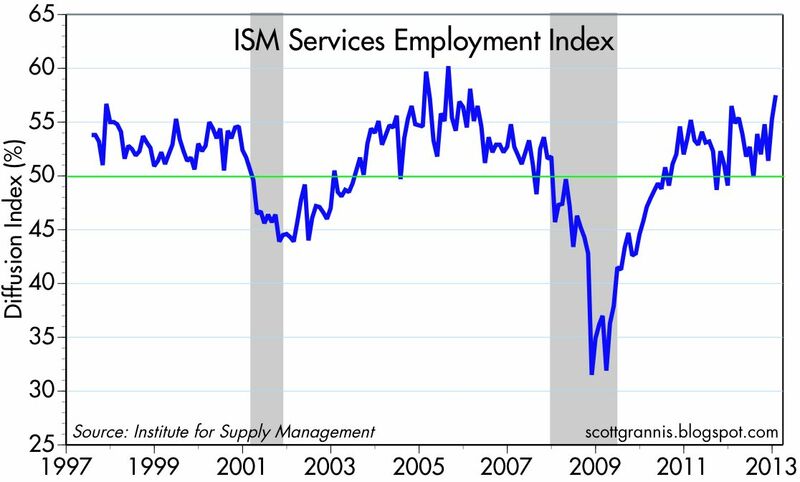 Service sector businesses appear to have stepped up their hiring activity, and that augurs well for future economic growth. 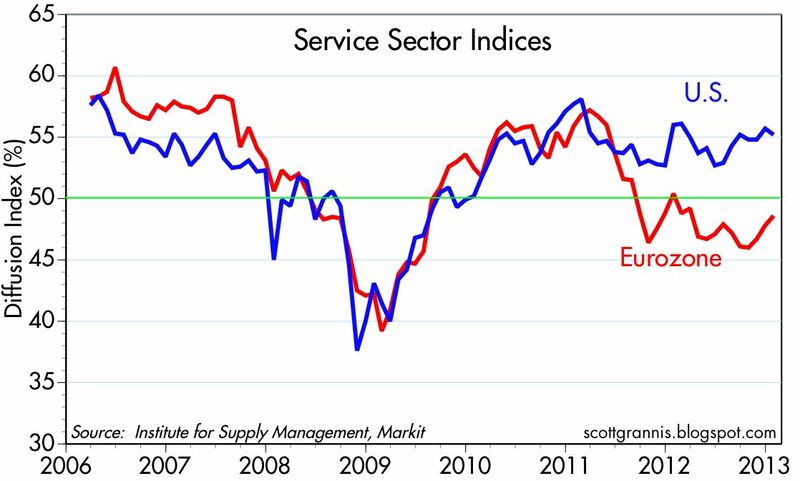 As the U.S. service sector continues to post moderate growth, its Eurozone counterpart is slowly shaking off the contractionary pressures that have beset the region since the second half of 2011. It remains somewhat of a mystery to me why the Federal Reserve needs to keep the monetary pedal to the metal (e.g., keeping short-term interest rates at extremely low levels and continuing to purchases additional Treasury and mortgage-backed securities) when the great majority of economic indicators reflect continued growth and little or no threat of a recession, and have done so for the better part of the past few years. 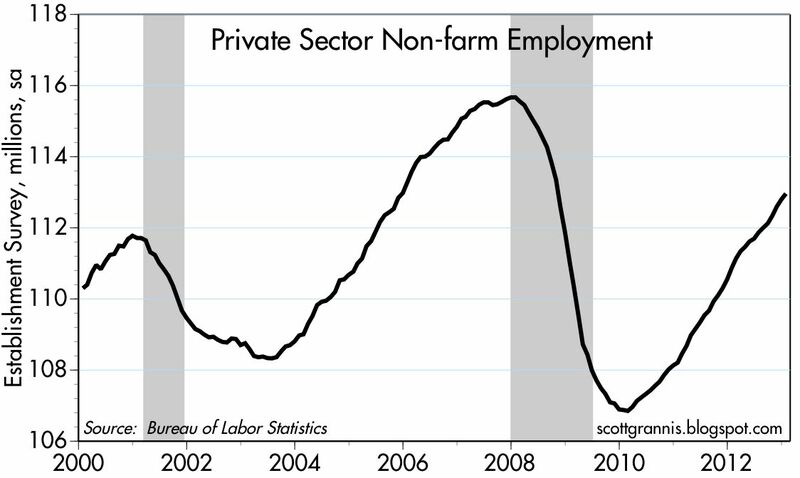 Consider the above chart of private sector non-farm employment. There have been about six million jobs created in the past three years, and at a fairly steady pace. While the economy has not yet fully recovered all the jobs that were lost in the last recession, it is undoubtedly improving and seems likely to continue to improve. Are we so impatient for recovery that monetary policy needs to spend a fifth year in uncharted waters?